To access images and videos stored on your Droid X, you start the Gallery app. You can find it on the Applications Tray. When the Droid Gallery opens, you see images organized into categories. Touch a category to open it and view the pictures or videos it contains. The media is presented in a humongous grid. You can scroll up and down by flicking your finger on the touchscreen. To view an image or a video, touch it with your finger. The image appears in full size on the screen, and you can tilt the phone to the left to see the image in another orientation. When previewing an image, you can double-tap the screen to zoom in and then double-tap again to zoom back out. 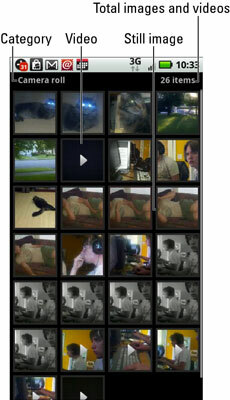 Videos appear with the Play Button icon. Touching the icon plays the video. To return to the main category in the Gallery, press the Back soft button.